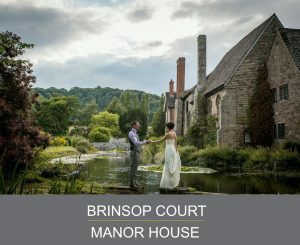 Grade 1 listed Brinsop Court Manor House sits dramatically in an 800-acre private estate surrounded by manicured gardens, peaceful moat and beautiful Herefordshire countryside. 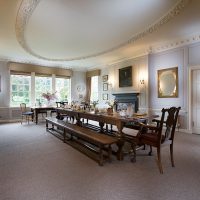 Famously visited by William Wordsworth, this historic manor house offers a variety of inspiring settings for marriages and civil ceremonies. 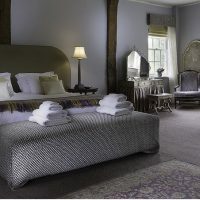 A luxurious bridal suite and romantic 5-star Ivy cottage provide secluded retreats for newlyweds. For the guests, there are 18 sumptuously appointed rooms with a fusion of modern comforts and stylish features. Whether you wish to hold your celebration indoors within the 3 atmospheric licensed rooms, or outside in the tranquil woods, manicured lawn, or picturesque courtyard, the dedicated wedding team can help you create the perfect bespoke wedding. This magnificent space with exposed vaulted ceiling, solid oak floor, grand fireplace and gothic windows is guaranteed to leave a lasting impression on your guests. 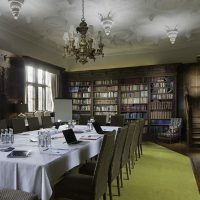 Suitable for smaller weddings, the library is decorated with wall to wall oak panelling, feature fireplace and ornate stucco ceiling for an atmospheric and sophisticated celebration. Light and naturally lit, the Queen Anne Room showcases a period plastered ceiling, striking fireplace and tall window overlooking the moat. Perfect for more intimate gatherings. Adjoining the Queen Anne Room you find the comfortable Oak Parlour. Furnished with relaxing sofas and toasty wood burner it provides a quiet retreat from the excitement of the party. It also offers access to the restful lawns and garden through the Tudor heavy door. The games room is ideal for use as a dance space, equipped with snooker table, table tennis, darts, TV, and warming open fire. In addition, a Bose Soundlink 3 can also be provided for use if required. 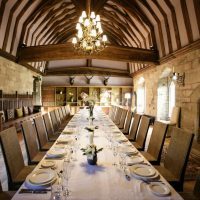 Because the experienced wedding team have hosted a number of celebrations at Brinsop Manor, they can recommend a variety of quality suppliers. Not having a drinks licence at Brinsop Manor means that you can bring your own drinks. Therefore, you can make significant savings with your budget. For a stress-free alternative, a cash bar is recommended. To discuss your needs and options, please call 01432 509925 or take advantage of the online enquiry form on the website.